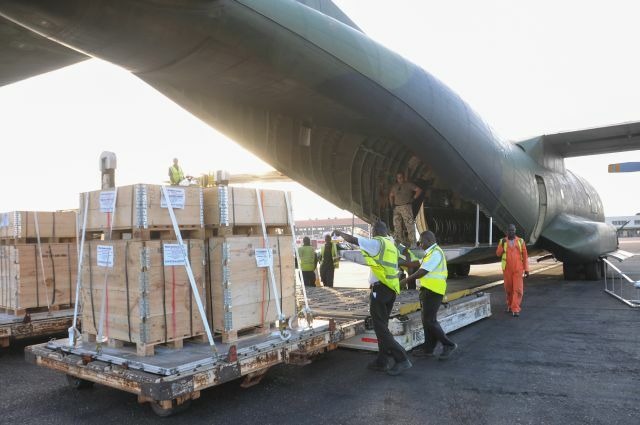 arrival of a German aircraft which will be delivering needed supplies and material to countries in western Africa affected by the Ebola virus. UNITED NATIONS, Oct 22 (IPS) - The widespread outbreak of Ebola in West Africa, which has resulted in over 4,500 deaths so far, is also threatening to trigger a food crisis in the three countries already plagued by poverty and hunger. Dr. Shenggen Fen, director-general of the Washington-based International Food Policy Research Institute (IFPRI), told IPS the crisis is expected to be confined mostly to the countries directly affected by the spreading disease: Liberia, Sierra Leone and Guinea. Asked whether the food shortages will also reach countries outside West Africa, he said Ebola is triggering a food crisis through a series of interrelated factors, including farmer deaths, labour shortages, rising transportation costs, and rising food prices. "Within these countries, where undernourishment has long been a problem, the food crisis may persist for decades," he warned. And because Sierra Leone, Guinea, and Liberia are all net food-importing countries, the Ebola-triggered food crisis is unlikely to spread to other countries in the region or beyond, Dr. Fan added. Global food prices tend to have transmission effects on regional or national food prices, but for small markets (on a global scale) such as these three countries, the transmission effect of food prices is unlikely to pass beyond their own boundaries - so long as the disease itself is not transmitted, he said. According to the latest figures released by the World Health Organisation (WHO), there are over 9,000 cases of Ebola, including 4,262 cases in Liberia, 3,410 in Sierra Leone and 1,519 in Guinea. The death toll is highest in Liberia (2,484), followed by Sierra Leone (1,200) and Guinea (862). U.N. Spokesperson Stephane Dujarric told reporters Monday the WHO has officially declared Nigeria free of Ebola virus transmission, after 42 days without a single case. WHO called it "a spectacular success story that shows that Ebola can be contained". "Such a story can help the many other developing countries that are deeply worried by the prospect of an imported Ebola case and are eager to improve their preparedness plans," he said. Dujarric said the announcement comes only a few days after Senegal was also declared Ebola-free. He said the trust fund set up by Secretary-General Ban Ki-moon to battle the deadly disease now has about 8.8 million dollars in deposits and 5.0 million dollars in commitments. In total, 43.5 million dollars have been pledged and the secretary-general continues to urge countries to turn these pledges into action as soon as possible. He expressed regrets over the Ebola-related death of a UN-Women staff member in Sierra Leone. His spouse is currently receiving treatment. "All measures to protect staff at the duty station in Sierra Leone are being taken as best as possible under the current circumstances," Dujarric said. This includes decontamination of the U.N. clinic, disposal of the isolation facility and contact tracing, he added. In a statement released Tuesday, IFPRI painted a grim picture of the situation facing all three countries. Schools in Sierra Leone have closed, shutting down critical feeding programmes for children. And restrictions on the consumption of bush meat, the suspected source of Ebola, have eliminated a traditional source of protein and nutrition from local diets. "In addition, the costs of staple foods including rice and cassava are rising precipitously in the affected areas as crops are abandoned and as labor shortages grow," the statement added. Food that would be imported from these areas is not making its way to other regions, either. "So, as we weigh the dangers of this dreaded disease, we must not forget the very real threats it poses to food security," the group warned. "The global community must come together to ensure that there are safety nets to protect not only those infected with the disease, but also those whose access to food is severely affected," IFPRI added. Asked to identify these safety nets, Dr. Fan told IPS social safety nets are needed to protect not only those infected with Ebola, but also those whose access to food is severely affected. These safety nets, which could be in the form of cash or in-kind transfers (context-specificity is important here), should be accompanied with nutrition and health interventions. For example, a conditional cash transfer programme linked to health can help improve access to nutritious foods, particularly when prices are high, while promoting health service use, he added. "This is important, because investing in the nutrition and health of vulnerable populations could lower the mortality rate of diseases like Ebola, as nutritional status and infection are intricately linked." In the post-Ebola era, Dr. Fan said, combined social protection and agricultural support interventions will be crucial to build resilience to future livelihood shocks. Asked how many people will be affected by this impending food crisis, he said with Ebola claiming lives of thousands of people in Sierra Leone, Guinea, and Liberia, the mounting food crisis is impacting thousands more still. Recent efforts by the World Food Programme (WFP) to provide food assistance to around 1.3 million people in these three countries indicate an idea of the scope of the current crisis. The Food and Agriculture Organisation (FAO) is also providing food assistance to nearly 90,000 farming households to abate the food security crisis, he pointed out. As the harvest season is beginning, labour shortages are putting the food security of tens of thousands of people at risk in particularly affected areas, he declared.